As time went by, many models were added but they didn’t really make themselves noticed; this is until 2007 when the E-3 was released. This represented another step in the evolution of the Four Thirds series and it was clearly improved in every aspect compared with its predecessors. Now, in 2010 Olympus is ready to unveil the E-5 that represents the highest point in the evolution ladder. The Olympus E-5 has come a long way from the E-3 and it is clearly aimed for semi-professional and professional photographers. The market is filled with good models from other manufacturers and the competition is quite high; Canon and Nikon are some of the giants that rule this sector but Olympus seem to have a lot of faith in the new E-5 that will earn a share of this market. A quick look at the camera will be enough for Olympus fans to realize that it is very similar with previous models and quite a familiar body. The front is roughly the same and the size of the camera as well as the weigh are a bit above average for cameras in this segment but the good and comfortable handle makes it perfect for any situation. The thing that stands out is the built in flash that can be used with a simple flick of a button located on its side. This feature is more for semi-professional photographers as the other pro DSLR models come without this feature. The real changes were done to the back of the camera and the first thing that pops up is the foldable and rotating display that measures 3 inches. At a resolution of 920.000 dots, the display is clearly a great tool to have and the quality and value of it matches the competition. It is very useful especially in Live View and when shooting from a difficult angle. 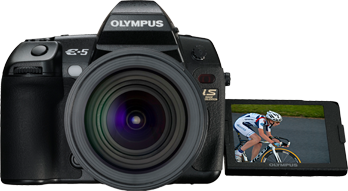 The Olympus E-5 has clearly evolved in the last three years since its predecessor was released but the changes are quite subtle which can be considered a good thing for E-3 users. The changing will be done very smoothly and users will even be able to use the same underwater casing from the E-3. Don’t think that will blow your mind away but the E-5 remains a good DSLR camera for semi-professional and professional photographers that has really evolved and improved over the years. Olympus is known for the innovative ideas that make their cameras unique, the design that is always good looking and yet practical and the final results that satisfies clients. It has been the first to solve different problems, one of them being the Super Sonic Wave Filter available on the E-1. Until then, it has been adapted and used in different forms for many DLSR cameras as well as system cameras. It is a revolutionary feature that was later on found in competitive models and it can eliminate dust and dirt from the sensor. 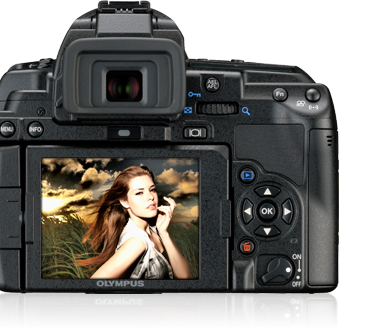 The many studies done by Olympus and ongoing research show that 12 megapixels is the best amount. They have defended this statement on many fronts and it seems a good idea but it can be difficult when competitors increased their image resolution to14, 16 and even 20 MP. An improvement here is not really necessary because users know that the E-3 was amazing and great for professionals. We can only expect the E-5 to be as good if not even better especially now that it has the TruePic V+ processor designed especially for the E-5. The 12.3 MP are used at full capacity and no pixel is taken for granted, this is what makes Olympus great at what they do.